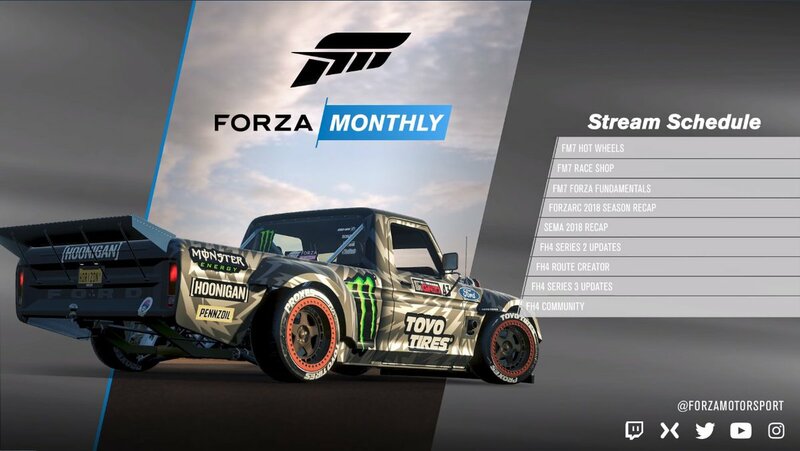 Our latest episode of our monthly magazine show all about the world of Forza is coming to you on Monday, November 5, beginning at 1 p.m. Pacific. 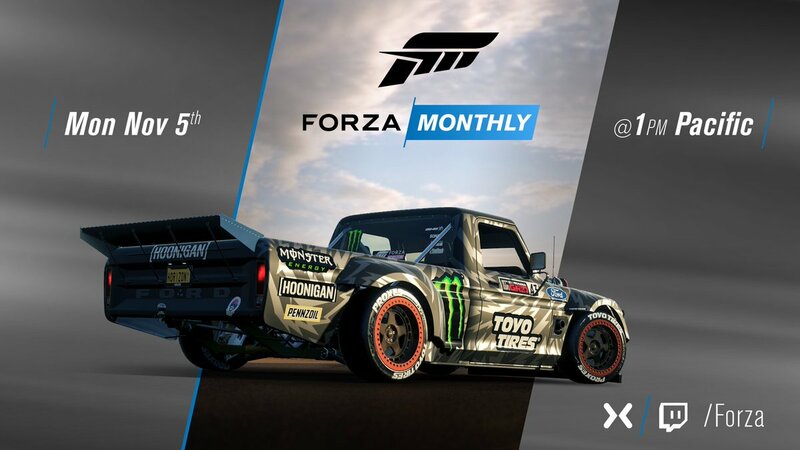 We’ll have guests from all over the world of Forza, and we’ll be diving deep into the November update for Forza Motorsport 7, as well as giving you a sneak peek at Season 3 in Forza Horizon 4 with Playground Games, and a look back at the ForzaRC 2018 season with some special guests. It’s going to be a fantastic show so be sure you’re tuned in to our Mixer and Twitch channels to watch it live! Can't wait to see what the November update brings to us. I really hope to see something of Race Regulations. At 2 am in Europe. Darn it! Forza Fundamentals: new Collision Assist turned Off behaves like single player, while turned On, the yaw/pitch/roll effects of a collision will be muted, allowing you to recover better from impact, leading to a "cleaner" feel to multiplayer racing. Hit box light contact is designed for a better player experience. Future project: A whole team is working on Drivatar behavior, working on new driving lines, targeting ForzaRC level skill, working to get rid of rubberbanding and overpowered behavior. Race Regulations currently in testing phase (not coming this month or next month). plenty off free stuff thanks Turn 10 but no race reg yet soooo sad !!!!!! Wait wait wait....not even coming next month?? Hahahahaha, oh god. Multiplayer will stay trash for a very long time it seems. Also nothing about improving FFB! I'm trying to understand about the collision assist. I hope the new collisions will be ON in class hoppers. That's all I care about since we won't get race regulations this year. Awesome car, thank you for that! Good to know, but the garage limit comes in the way pretty soon. Raising it from 900 to 950 or 1000 is not possible? I'm still not interested in these cars, but yeah, I made my point about that in the other thread. The only question I have: Is EVERY driver suit possible to show up, or only these that were in the crates before? I know of course, that DLC suits and career suits are not in the shop obviously. Good, but I still prefer rivals, career and ghost leagues (rarely). Don't see, how that will improve the MP experience in general. Kids/aggressive players will find a way to ruin the experience. But it's a good start in the right direction, I think. I wished there was a way for only adults allowed-lobbys. In that I have immense high hopes in. If they do it right, the game is having a 2nd spring for me. But it is really easy to disappoint me here, please take the time it needs, I will wait patiently. That seems to be a huge thing. I hope they don't forget to fix the most annoying bugs. This and the drivatars are the only thing, thats really important to me. They can do with MP what they want, I will be always a single player gamer first. You know, these guys are no robots, who can snap with the finger and everything is there. Things take time, to do it right. I believe collision assist is ment for the online racing so it would be very stupid to have it off. I hope it works. But those regulations are already late, pushing back few months i doubt there are people racing anymore at all. They should have at least put the permaghosting to backmarkers. I have not raced in months because of the wild west mentality, so i tried few nights back this endurance hopper. Some player spent all their time to crash leader out of the game. Watking Glen 22 laps. Went back to pits to fix car and repeat. I was knocked out 3 times and many others was also. So how this one man show is to be fixed so people could actually race? Without these jokers to force you to do more pit stops. Reports doesn't do anything. Cannot kick. Just have to survive. You do know we've been waiting something like 8-9 years for a solution to that plague in multiplayer, right? I believe collision assist is ment for the online racing so it would be very stupid to have it off. I hope it works. But those regulations are already late, pushing back few months i doubt there are people racing anymore at all. Yes, a bit late, but I think this is one of the features preparing for the future of the series, for FM8. Testing it in FM7 and make it even better for release in FM8. Imagine a finished, polished and well tested FM8 with all the features now introduced with FM7. Maybe they release a big expansion next year with new tracks and career-events and re-release the game with additional content. Could get many players back. That doesn't mean they started developing it for FM7 8-9 years ago, so thats a pretty stupid argument. You have to accept, that they started a few months ago and they need the time. Moaning about that, doesn't make it go faster. But they should have. We have always been right here, giving them feedback and ideas. If they started implementing it years ago there wouldn't be today a 28 pages long thread about Crashing and griefing in multiplayer. And this, just in FM7 forum. I have to accept it? Hey sorry but you saying words like "stupid argument" and "moaning" won't stop me and other people from voicing our opinion. We are genuinely fed up of this situation...also considering T10 put 1) a hidden vote to kick option in lobbies since FM5 and 2) a hidden negative feedback option in FM7 ....Both features are useless and feel like an insult to us. For now the only way to go is marshals in lobbies and replays with video proof of unsporting behavior. By the way, how many years to come do we have to repeat that this game desperately needs "GHOSTED BACKMARKERS"? Let me repeat it one more time: ghosted....backmarkers. That would be so simple and effective. I agree. Ghosted back marketers seems a slam dunk and pretty much instantly kills off the trash as soon as you can get by them. Certainly seems much easier than the new collision physics update. And I can see that for private endurance, league and FRC ghosting back markers isn't going to fly. Simple, just make make it another setting forced on for all/most public hoppers, and set off as desired/needed. I give the devs a big break on most of this, but why that's a hard sell so even an MBA manager could grasp is beyond me. Yes and yes 10 years of faith in turn10 , supporting,and buying games, the race regs are the core of a motorsport game . The only thing I say is, that they said they working on it and it needs obviously more time. There is absolutely no reason to complain about it now, because it doesn't change anything magically. Right, so because they said it will take forever to implement it, that means we can't complain, what a joke. Except nothing important ever gets implemented, no race regulations, no ghost backmarkers, no improved FFB, no better lobbies, no different tyre types and etc... the list is so long that if they are taking this long to implement ONE thing, that means this game will remain broke forever. Chris Esaki is officially one of my favorite people that has ever existed. The "I demand it. I DEMAND IT NOW! "-crowd is really funny sometimes. These words you are using..."forever"..."nothing important ever"...are just childish, because its not true. Only because they didn't implement the things YOU want, doesn't mean they did nothing important. Car selection fixed? Track limits? Class based rivals? These things were really important to me. But I get your point and I get ACR HardVibes point. You are tired of waiting, you don't trust Turn 10, if they say it probably comes out in january's update. The same goes for drivatar overhaul for me. Since FM5 released, I hated this feature, because they were never as good as in FM4. Not well balanced and often leaving the track on certain corners. The only difference between me and you guys is: I have patience and still a bit faith in Turn 10. Everyone at Turn 10 who is responsible for the decision to implement that car! They should do a making of- video how they implemented it. An overhaul of drivatar behavior!! Finally good news for those of us who exclusively play freeplay mode. I’m hoping they fix the drivatar livery issue with the behavior fixes as well. Hey Turn 10 if you need someone to help give you specifics on problems with the drivatars, I’m sure there are plenty of folks who would be glad to do so, myself included. They said there'd be penalties in the game before it was released over a year ago. Griefers would be 'taken down'. Over a year later we're still waiting, and they don't even do the most obvious thing of ghosting backmarkers. People have a right to be impatient at this point. It ain't good enough. Been waiting for what seems like an eternity for this. Surely even a stop gap of ghosting backmarkers couldn't take that much work. I'm loving the road map for this game but the Forza community is growing inpatient.